Congratulations to Nathan, Dale, Kris & Keith who graded for their 1st dan black belts, and Tobiasz who graded for his 2nd Dan black belt in July. Your determination and commitment to the sport has been clearly demonstrated over the past 4 to 6 years. You have all shown superior strength over the past 1 to 2 years, and most recently the final leg of your journey to your next Dan grade by running classes in preparation for your marked piece, and the gruelling 4 hour grading you all endured in July. Achieving your Dan grade is a serious test of character, very few are capable of achieving what your have achieved. Very few commit to a sport for the length of time you have. Your consistency towards training, the individual lifestyle changes you have made to work towards your next belt over recent years, the advice you have taken on board and the knocks your have encountered throughout your training career you have come back from. 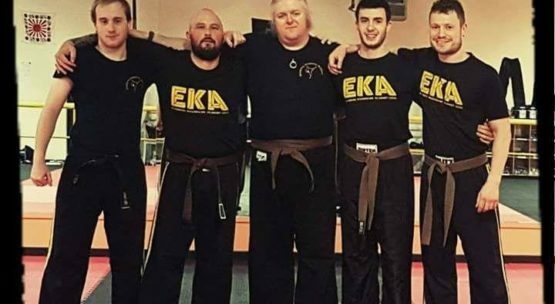 Your physical grading in July was the final test to see if you were prepared for the road ahead now you have joined the new class of black belts, or in Tobiasz case, moved up the ladder to a new level of expertise. Every one of you has your strengths and weaknesses’, achieving your next Dan grade is not the end of the road, it does not expect perfection, after all, what is perfection - we are modern freestyle martial artists, not traditional martial artists. Many will questions you along the way, lesser experience martial artists may question your worth, those who haven't endured the challenges you have, the obstacles you have personally overcome, on and off the mats. Use this as a driving force not to give in, not to back down, be the best your can be, and to never ever give up. A black belt grading in marked on many things, it is tailored to test your mental ability as well as your physical ability. It is designed to test your strengths as well as your weaknesses. It is not developed to make a spectacle of oneself or bully you into submission, belittle and criticise your weaknesses, but to congratulate you on your training career so far by the accomplishments you have all made. You’re now part of the few and I welcome you all into the new world of black belts and hope you will continue with us for many years to come. Be proud of your success. Stay close to your fellow black belts, as only they truly know what it means to be a black belt.